From the Herbs & Gardens Festival's "Books Abloom," in Sunset, to the Breaux Bridge Crayfish Festival, Louisiana has been up to its neck in what it does best: Festivate! 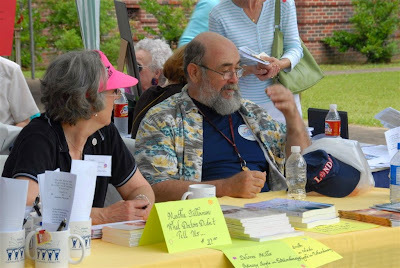 The Professor said the Breaux Bridge Crayfish Festival was second only to Mardi Gras itself for debauchery. Books Abloom, a Louisiana book-meet at the sweet and pure Herbs and Gardens Festival in Sunset, was a place to chat and sit in the shade. A place to buy cookies and cakes from nice ladies in Summer hats. A place to sign LOUISIANA IN WORDS and sell ice box magnets destined to save your refrigerator from the wild vermin should we have another killer hurricane. The Breaux Bridge Crayfish Festival was something else. There we rode the Ferris wheel, bumper cars and the two-dollar 16oz Abita beer wagon till the clouds roared and crowds floated by. The Herbs and Gardens crowd pulled their favorite plants about on little red wagons, while ageing hippies sold bath salts and perfumed soaps. I'm not sure there was a beer wagon. However, Mellow Joy gave out free yellow cups of coffee. Peace in our times. The Professor bought herbs for his Spring "parterre," a kitchen garden, a "jardin potager," behind the little Cajun cottage on the prairie. I signed FRENCH QUARTER FICTION and LOUISIANA IN WORDS, the two best-selling Louisiana short story collections edited by New Orleans' latest carpetbag savior, Joshua Clark. On the drive down to Breaux Bridge we stopped for boudin and beer at Janice's, where we once saw New Orleans' earlier savior, Mayor C. Ray Nagin, buying boudin by the cooler full, just before Obama came to visit. No reports on how the man who would be President took to our spicy links. We had ours on the Evangeline Freeway tossing skins out the rooftop. Once there were bumper stickers that read: "Be Alert for Flying Boudin." Once, in the Cajun Camelot. In Breaux Bridge, a handsome young black cop directed us into the parking lot and took the Professor's five-dollars. He said it was an easy walk to "the fest," for a "young man, like you." I said, "He has an old coot in tow." The cop lithely leaned in the window and said, "Hope I'm still doin' it when I'm there, too." He grinned and pointed us to a closer parking spot. Peace and Truth in our times. Want a magnetized image of LEJ's fat face for your memory board, or to scare future storm vermin from your abandoned refrigerator?